You may recall that Amelia won the father's day essay contest in the spring. I recently had the pleasure of finally meeting this little cutie and her super sweet parents Stephen and Lindsey. I challenged myself to take pictures of Amelia and Steve that say "father and daughter" but not just your standard portrait. This typically works best with little ones Amelia's age anyway because they are constantly on the go and don't want to mug for a camera! This is Amelia and Steve (mommy Lindsey was dancing behind me to get their attention). This is my favorite picture from the session... love Amelia's bright, wide eyes and Steve's smile in the dark background. Amelia loves to play hide-n-seek. Mom jumped in for a few photos, too. I hope these pictures bring you lots of joy, Stephen. It was easy to see what a great father you are. Amelia is a very lucky little girl! Hope to see you all again soon, perhaps on the Eastern Trail! New Yorkers Kim and Chip met at a mutual friend's birthday party. But it turns out, they had "met" months before on match.com. And they even have the same birthday! Can you say, Fate? Kim has vacationed in Maine for many years with friends and family and so it seemed the perfect place for their "I do's." Kim has a great habit of throwing her head back when she laughs. I love the emotion in this preparation shot. Kim requested a shot of her engagement ring on her flip flops. Meanwhile, J was with the guys. During a groomsmen huddle, he quickly got low and snapped this fun angle. Kim's parent's giving her away (see, head-back laugh! Love it). While I was on the deck (this is Lady, Kim's parents' dog), J was up on the roof. Kim and Chip shed their shoes for their first dance. It's not often I'm able to predict and position myself correctly for a potential dip, but I was lucky and got this great capture. Chip contemplated eating the cake himself. Deb Corey did a great job on the beautiful flowers. Guests got down, way down, on the dance floor. And the flower girl caught some air! Happy marriage, Kim and Chip! I hope you are having a blast on the safari in South Africa and at the beach in Mauritius. We can't wait to see your images when you get back! The next round of drinks at The Ramp is on us! Cathleen and Jeff brought their black lab puppy, Jackson, to our initial meeting and I immediately knew we'd get along just fine. Jeff proposed in a snowstorm while on a horse-drawn carriage ride in Stowe, VT. Although they live in Newburyport, MA (such an adorable town), they decided to marry in Vermont, too. They chose a gorgeous venue in East Burke (north of St. Johnsbury, not far from Canada!). Jeff, who is in graphic design, made their wedding invitations and had them letter pressed at William Arthur. Aren't they gorgeous? I love the variety of color. This is the Morgan Barn where the reception was held. I was so excited when I saw the room Cathleen would be getting ready in. It had great light, and I loved that I could capture both the dress and Cathleen in the same frame! A horse and carriage transported the guests to the meadow at a top of a hill for the ceremony. Great shot, J! While I was at the front of the aisle, J captured Cathleen awaiting her cue. Beautiful. It was VERY cold at the ceremony site (many guests were bundled in blankets!). As Cathleen was walking up the aisle w/ her father she asked her guests if they were doing ok! I have never seen a bride chat walking up the aisle and it definitely made everyone giggle. Even despite the overcast day, the scenery was still spectacular. J caught this image of the guests walking down the hill from the meadow after the ceremony (I was up top shooting Cathleen and Jeff getting into the carriage). In many of their portraits, Cathleen's veil is vertical from the wind. I love, love, love that their mouths are the only part of their faces exposed in this image. The Morgan Barn is one of the neatest barn reception sites I have ever seen. It's very clean, well lit, and spacious. This was the set-up for dinner. Notice the tables in the stalls! And during dinner. Loved the overhead and Christmas tree lights. Great ambiance! A western swing band entertained the guests on the dance floor. It was very different, and very fun! Thank you so much for having us, Cathleen and Jeff! Many congratulations! I hope you are having a blast in Italy (and I hope Jackson is doing well at his therapy-dog training!). As a side note, we had a fabulous dinner at Elements in St. Johnsbury. If you are ever in the area and looking for a great meal, definitely go there! Thanks for the recommendation, Cathleen and Jeff! I will be out of the office for the next two days with limited access to email, if any (yes, it's nearly time to get an iPhone). Please feel free to give me a call on my cell phone (#877-2-EMILIE). While this trip is mostly business (J will be speaking at a photography seminar near Boston) and some pleasure (a Red Sox game w/ friends Chris and Cyndi Smith, photographers from Kennebunkport), we will also be attending the funeral of my darling step-grandfather Ed who passed away late last week. Please keep my stepmother Paula and our family in your thoughts (xo!). I have much to blog about from the last few weeks when I return. My Jeep has a new voice. She hasn't been named just yet, but I'm sure after this weekend's road trip she will! J and I are headed to Vermont and back to Maine for two weddings this weekend. And with several trips to Boston and New York in the upcoming months (Boston is the most confusing city to drive, I swear, even tho I grew up nearby! ), I figured it was time to give Mapquest print-outs a rest and try satellite navigation instead (and save any future potentially heated debates w/ my co-pilot). 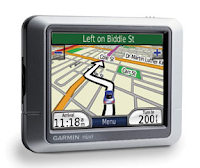 I got the Garmin Nuvi 200. It's a basic model, small enough to fit in my purse to take around in pedestrian mode when navigating new places by foot. Cool! I haven't even tried it yet, aside from entering my home location, and I'm already in love (I even downloaded this sweet wagon as my car icon. We had one of these as kids!)! I am so, so, so excited today! After planning since March, I can *finally* announce some big news!!! Next summer I am hosting a photojournalism workshop for wedding photographers on Cape Cod! I've rented a great house on the water and gathered together a handful of dear friends and talented photographers and photo editors in the industry to teach. You can learn more by checking out the website which launched today (and yes, that link in the left column is finally active)! If you know any wedding photographers who might benefit from this type of experience, please send 'em my way! Many thanks to liveBooks for sponsoring the workshop with this great site! Mark is from Massachusetts; Krista is from Maine. Currently living in New York, these lawyer sweethearts settled on New Hampshire when trying to decide where to have their wedding. They planned to have a beautiful, fall seaside ceremony. But Mother Nature had other plans! It was 96 degrees, and a fast-moving storm forced the outside ceremony under a tent (and it thankfully passed soon after). 1. The ceremony site as it was intended. 2. The groomsmen conferencing on the darkening sky. 3. Quickly moving the chairs under a nearby tent! I love this guest's face as she runs into the ceremony tent. Just after their "I dos" I caught Mark checking out his new ring. Everyone enjoyed the dance floor- especially these cutie flower girls. At the end of the night, Mark serenaded Krista with a fraternity song. Everyone say it together: "awwww." Congratulations, Krista and Mark! I really enjoyed capturing your big day for you! Have a great time on your honeymoon!! 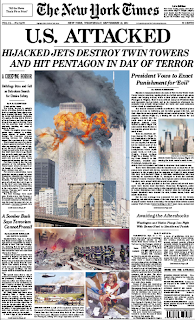 I wrote about my experience on 9/11/01 last year, but it's definitely worth pausing to reflect upon again this year. We're all so busy in our own lives that we often forget the feelings and emotions of that beautiful September day- the panic and fear, and the amazing acts of human kindness. I will always remember the days following- cabs didn't honk and people would say hello to one another on street corners waiting for walk signs to change. It wasn't long before the normal hustle and bustle, and head-down behavior returned, however, but I think everyone was somehow changed. I know I was. My thoughts and prayers continue to go out to the families and friends affected by this tragic day in our nation's history. God Bless. And J, please fly safely to LA today. And Happy Birthday to Lisa. Sara grew up in Greenville; Dylan is from Ireland. They met at a pub in Boston playing pool six years ago. They came back with his family for a wedding on Moosehead Lake. And goodness, it was brilliant (as the Irish like to say)! J and I had a great time with both of these amazingly fun, loving families. **Click here** to view the slideshow. Sara getting ready with her hilarious sister at their house- their father built the log home all by himself. Sara wore a very cool gown with intricate lace and beading details. Sara's mom left her a funny note, and we posed their rings with wine corks (the reception tables featured pictures of the guests at each table, with wine corks used as stands). J captured a very sweet series between Dylan and his father getting ready. The ceremony and reception sites at the Blair Hill Inn overlooking Moosehead Lake (it is also a working farm- the center photo is taken from inside a greenhouse overlooking the tent). The beautiful ceremony. J was in the back, and I was up close. Check out these sweet shots by J! He used the white tent background to his advantage by blowing out the background and creating these high-key images. I am so proud! I loved watching Sara's tender relationship with her family. They didn't have just one wedding cake- they had several! This posed a bit of a problem when it was time to cut the cake. Which one? They sliced a few different ones before handing the task over to the Inn owner, Ruth (who is great!). When we went back up to the ceremony site for a mini portrait session, the sun was hiding behind some clouds which had a moody, almost Irish feel! A few minutes later, the sun reappeared and warmed up the scene. And thanks again to J for lending his time and talent to join me at another wedding. I am continually impressed with how having two photographers and two angles far exceeds anything I can do on my own. I love it!